Raena Suggs learned what was wrong and how to beat it. Guard Raena Suggs will attend the University of Nevada, where she is promised more of the academic help that has worked for her at Hopkins. No matter how hard she tried, Raena Suggs could not keep the nervous smile from her face. 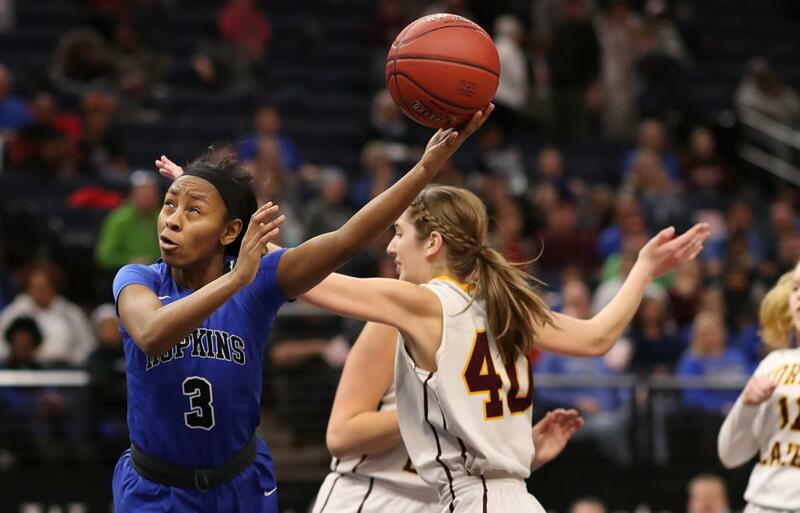 Suggs is accustomed to getting attention with her penchant for steals and three-pointers as a guard for the Hopkins girls’ basketball team. But clad in street clothes and speaking in front of friends, family and supporters in Hopkins’ Lindbergh Center as she signed a national letter of intent to play for the University of Nevada might have been the most nerve-racking thing Suggs has done. One that almost didn’t happen. For two seasons, Suggs has been considered among the state’s best off guards, a long-range bomber with exceptional speed and quick hands. She was a terror on Hopkins’ press, where her agility and anticipation created havoc for opposing guards. Her college possibilities seemed endless. Many colleges inquired, but few stuck around because of her grades. “She got a lot of letters, but then they all drifted off,” said Starr Suggs, Raena’s mother. It wasn’t for lack of trying. Suggs, who lived in Woodbury and commuted to Hopkins each day until recently, was putting in the time and doing the work. But tests were a different story. Last summer she quit playing with her North/Tartan AAU club to focus on schoolwork. Summer school, with a more individualized approach, seemed to pay off. But once she returned for the school year, the problems arose again. Early in this school year, a counselor at Hopkins proposed testing for potential learning disabilities. It took a while to get the results back, but when they did, they indicated Suggs had been coping with ADHD. An individualized educational plan, known as an IEP, was developed. And very quickly, results started to improve. Suggs scored a 98 percent. “I was really excited and so were my parents,” she said. In the ensuing months, Suggs had boosted her GPA to a respectable 3.1. And life seems much rosier. Nevada coach Amanda Levens had been one of the few college coaches to continue to recruit Suggs despite her difficulty with grades. The Reno-based university has assured Suggs that she will continue to receive assistance in college. Plans are to redshirt her for the first season while she gets acclimated to the school and the specialized learning process. While she wishes she had been diagnosed earlier, Suggs sees nothing but positives moving forward.